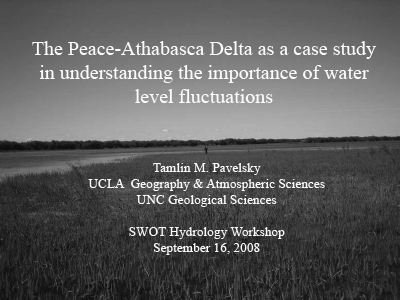 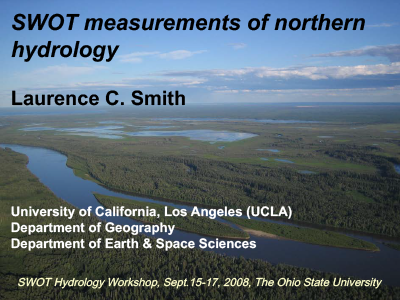 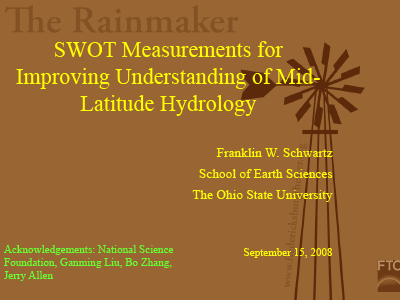 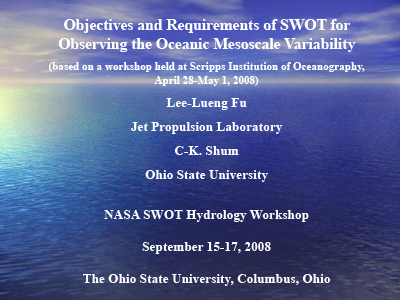 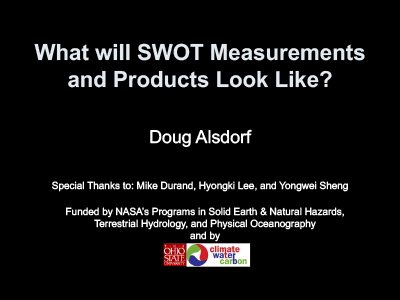 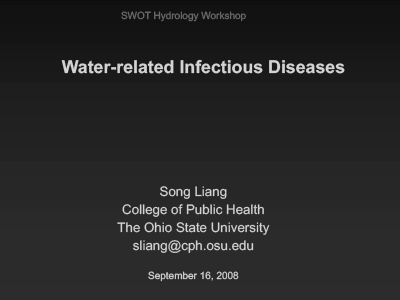 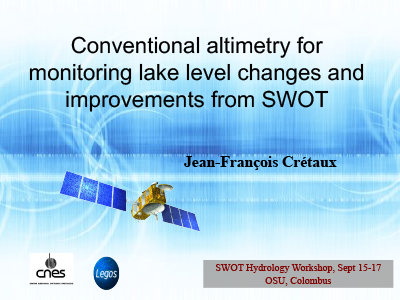 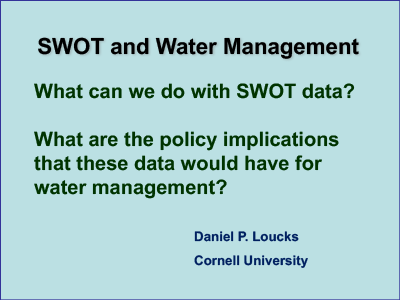 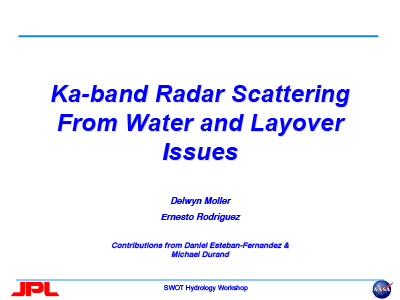 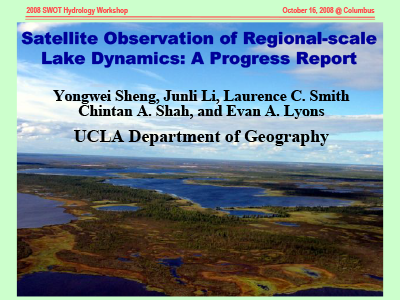 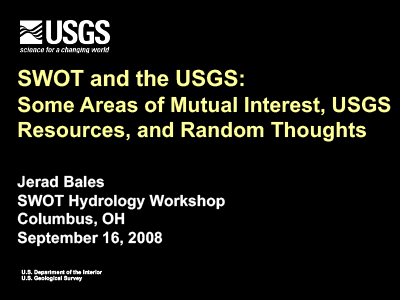 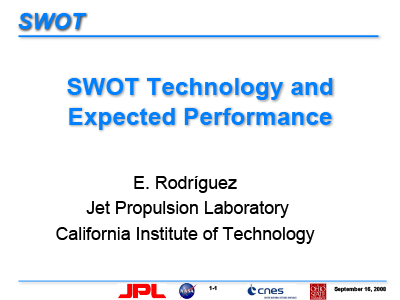 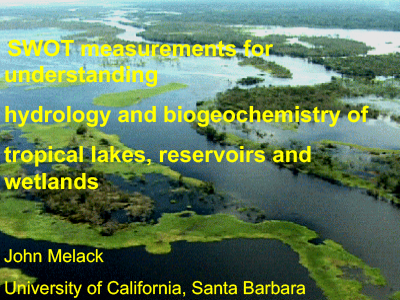 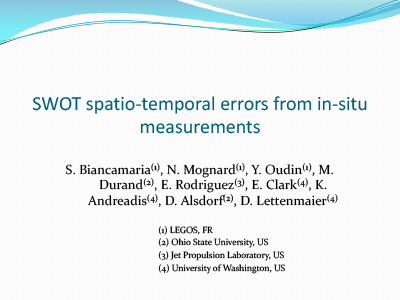 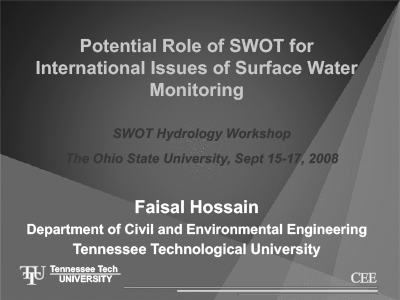 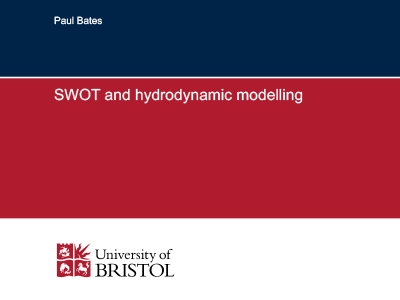 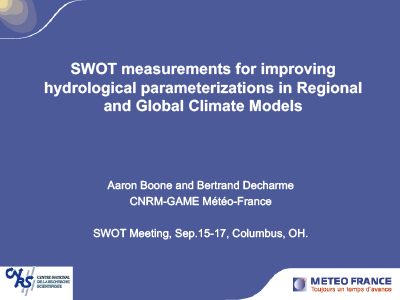 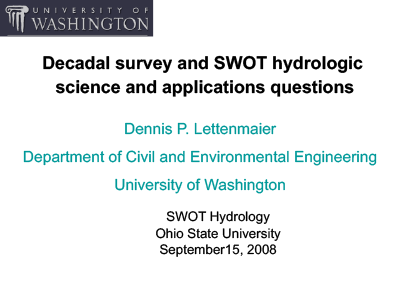 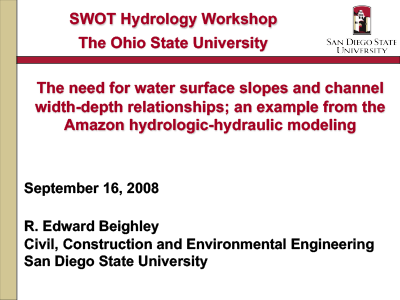 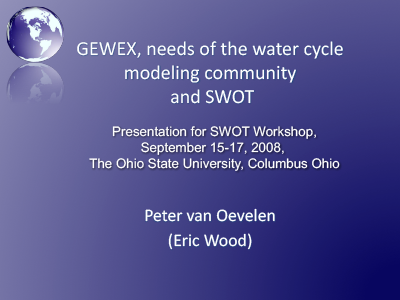 In mid-September 2008, a hydrology workshop for the Surface Water and Ocean Topography (SWOT) was held at Ohio State University, which included 73 participants. 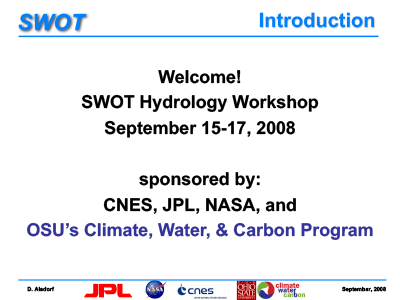 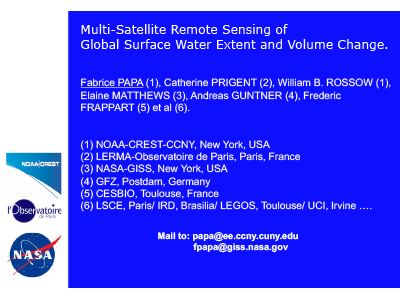 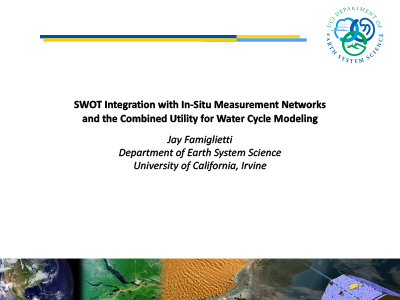 The first two days were designed to allow discussion and decisions regarding hydrologic science drivers for SWOT and definition of potential applications motivators (i.e., water cycle, floodplains and wetlands, society). 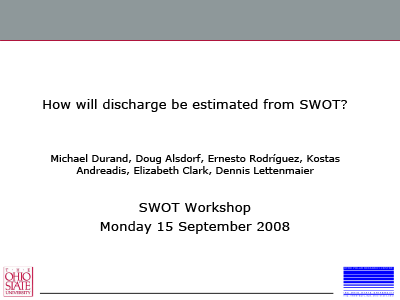 The third day focused on the mission timeline and planning, answering the question: How do we quantify the mission design so that the technology remains affordable and that data through-put constraints are met? 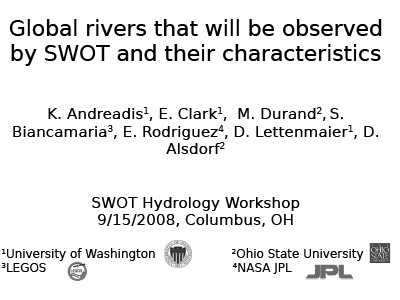 [16-Sep-08] Wood, E. and van Oevelen, P.
[15-Sep-08] Andreadis, K., Clark, E., Durand, M., Biancamaria, S., Rodriguez, E., Lettenmaier, D., and Alsdorf, D.
[15-Sep-08] Durand, M., Alsdorf, D., Rodriguez, E., Andreadis, K., Clark, E., and Lettenmaier, D.
[15-Sep-08] Moller, D. and Rodriguez, E.
[16-Sep-08] Papa, F., Prigent, C., Rossow, W., Matthews, E., Guntner, A., and Frappart, F.
[15-Sep-08] Fu, L-L. and Shum, C.K. 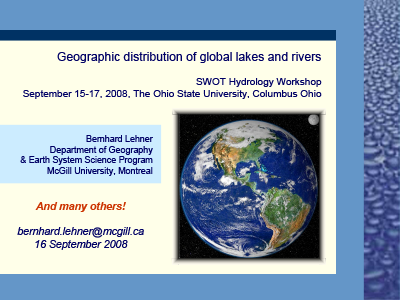 [16-Sep-08] Sheng, Y., Li, J., Smith, L., Shah, C., and Lyons E.
[16-Sep-08] Alsdorf, D. and Mongard, N.
[16-Sep-08] Boone, A. and Decharme, B. 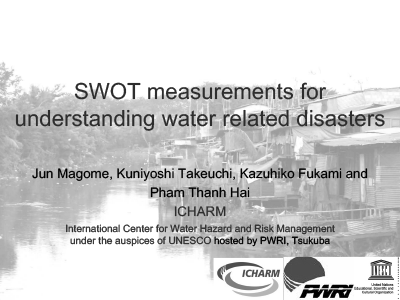 [16-Sep-08] Magome, J., Takeuchi, K., Fukami, K., and Hai, P.T. 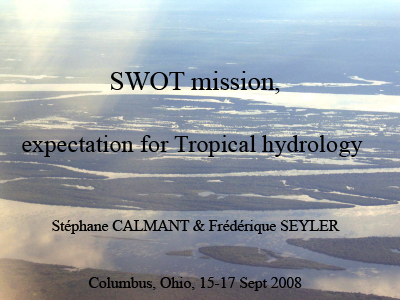 [15-Sep-08] Calmant, S. and Seyler, F.
[15-Sep-08] Biancamaria, S., Mongard, N., Oudin, Y., Durand, M., Rodriguez, E., Clark, E., Andreadis, K., Alsdorf, D., and Lettenmaier, D.
[15-Sep-08] Alsdorf, D., Mongard, N., Entin, J., and Lindstrom, E.